“May I have a large container of coffee?” This handy mnemonic never made it to my German speaking classroom back in high school, but it would have come in handy to remember those elusive digits that make up the mysterious Pi! Mnemonics are one of my favorite ways to learn and teach because they work and make learning more fun. 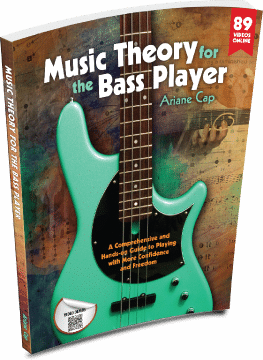 visual mnemonics – we can visualize shapes and diagrams on the bass fret board and associate them with objects we are familiar with! Auditory mnemonics can help us identify intervals! For example, you could link the sound of an interval to the beginning of a song you are familiar with. And kinesthetic ones (the feeling channel!) – as we learn to make box shapes on the fret board! Or emotional cliches for interval identification: ascending: major third ascending = happy; minor third ascending = sad; major sixth = romantic minor sixth = dramatic etc. Enjoy! Oh, and I would love to know – what music related mnemonics do you know? Any “old ducks going fishing…” to remember the cycle of fifths? What is “All cows eat grass” in a language you speak? Looking forward to your replies! i love how when you memorize the circle of fifths, then if you know any note on the fret board you instantly know all the notes on that fret..
so 6th fret third string is…. g#, which means the notes on that fret are _ _ g#_, which you then fill in from the circle => a# d# g# c#. this works on all basses no matter the fret or the number of strings. Agreed, it is a super awesome tool for understanding the fretboard! Just to clarify something: G#, A#, D# are not key signatures in the cycle of the majors. G# major would have 6 sharps and one double sharp which is quite impractical. Instead, Ab major has just 4 flats. That said, like you, I often use the cycle in an “enharmonic” way, meaning looking at the note names with all their names (G#, Ab) because it is quite useful for many things such as your example. Plus, your keys could be minor and then all is good too :).